IN PICTURE: SIGNING OF MOU AT COMMUNICASIA 2017. (FROM LEFT) RAJU CHELLAM VP NEW TECHNOLOGIES OF FUSIONEX, ANDY YAU CHIEF EXECUTIVE OF REDTONE DATA CENTRE SDN BHD AND GEORGE PAN CTO SOLUTION SALES DEPARTMENT OF HUAWEI MALAYSIA. 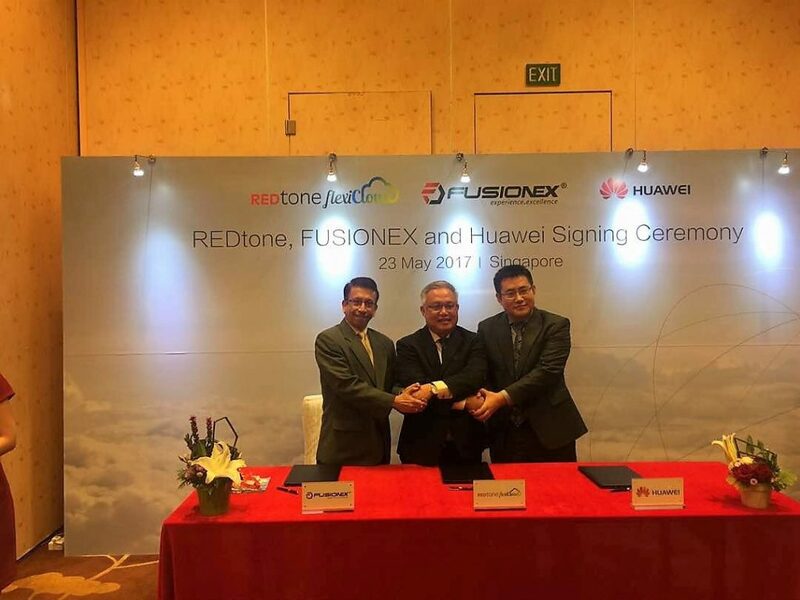 Huawei, REDtone (Stock: 0032.KL)and Fusionex (Stock: FXL.L)announced the forming of a tripartite partnership to serve the rapid increase in demand for big data and analytics Cloud solutions in Asia Pacific. A Memorandum of Understanding (MoU) between the three parties was completed at the Huawei eco-Connect, Singapore, in conjunction with CommunicAsia 2017, the largest ICT trade event in the region. The collaboration aims to leverage on all partners’ unique expertise to intelligently identify pain points and opportunities for users while lowering OPEX and CAPEX with on-demand one-stop cloud service solution. Huawei, a global leader of Telecommunications ICT solutions, will be cloud solution provider and the Go-to-Market advisor. REDtone flexiCloud, the next generation business-to-business cloud, offers Enterprise Cloud Services that runs on the Huawei’s cloud platform. Whilst Fusionex, an international software provider of analytics, big data and the Internet of Things (IoT), will contribute business insights and analytics-as-a-service to complete the full-suite of Cloud Solutions ideal for verticals including healthcare, retail and more. Noting the rising trend of digital transformation among SMEs, Mr Andy Yau, CEO of REDtone highlights how cloud services could help SME owners to kickstart the digitalization process for their business without incuring high investment. Mr Raju Chellam, Vice President, New Technologies for Fusionex Pte Ltd, also illustrates the amount of cost-saving typically ranging from 70%-90% of system installation charges depending on the nature of the industries.